He interacted with railway staff who have been affected and asked officials to expedite track restoration work. BHUBANESWAR: Even as train services on the mainline between Berhampur and Palasa have resumed after repair-restoration of signal poles and overhead electric masts, plying of trains on the branch line has been suspended as the tracks got washed away. 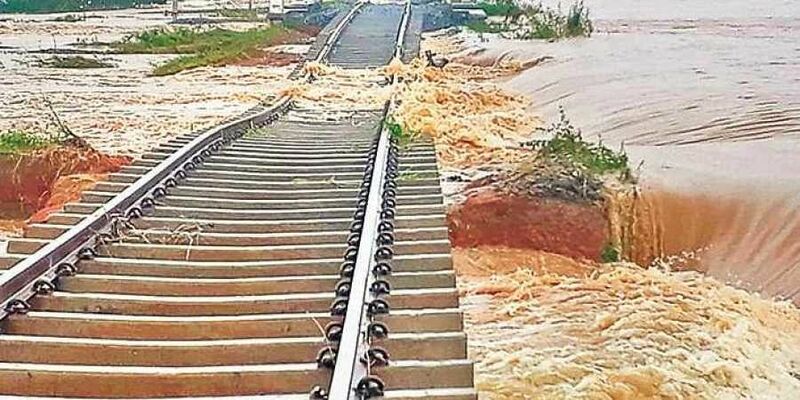 East Coast Railway (ECoR) sources said about one km of tracks between Tekkali-Peddasana stations in Kottabomali- Gunupur section were washed away, disrupting train services between Gunupur and Naupada stations. “Cyclone induced flood has caused extensive damage to railway tracks. The mainline has been restored, but station buildings at Palasa, Paralakhemundi and Mandasa are yet to be completely repaired. Some staff quarters have also been damaged in the cyclone,” said Chief PRO JP Mishra. Though train services resumed on the mainline, several south bound trains are behind schedule adding to the woes of passengers. The ECoR on Saturday cancelled five trains and rescheduled six others. The trains which have been cancelled include Puri-Gunupur Passenger and Raipur-Junagad- Raipur Passenger from Junagarh on Sunday, Gunupur-Visakhapatnam- Gunupur Passenger and Palasa-Gunupur-Palasa Passenger from Saturday to October 17 from both the directions. Puri-Gunupur-Puri Passenger from Puri will be short-terminated at Palasa and run as Gunupur- Puri from Palasa on October 15 and 17 and service of the train will remain cancelled between Palasa and Gunupur. Similarly, Howrah-Puri Jagannath Express, Ahmedabad-Puri Express, Mangaluru-Santragachi Vivek Express, Secunderabad- Bhubaneswar Visakha Express, Bengaluru-Bhubaneswar Prasanti Express and Yeshvantpur- Puri Express were rescheduled. “The trains services will continue to be rescheduled for a few more days till normalcy is completely restored. Restoration work, which was initially hampered due to rain, is going on in full swing,” said a railway spokesperson requesting the passengers to cooperate. Meanwhile, Divisional Railway Manager (DRM) of Waltair division Mukul Mathur inspected relief and restoration works in Naupada and Gunupur area. He interacted with railway staff who have been affected and asked officials to expedite track restoration work.